Over at Newsarama, DC Comics head honcho Paul Levitz writes about celebrating the completion of The Spirit Archives, a series of hardcover collections of Will Eisner's newspaper comic strip from the '40s and '50s. While he and other DC employees are champagne toasting because the 24 volume series reached completion, we here at io9 have an even better reason to celebrate the 24th volume: It's the one where Eisner's pulp crimefighter goes to space. As the popularity of Eisner's character - soon to appear in a Frank Miller-directed movie that looks to be more Sin City than Spirit - started to fade in the early '50s (partially due to shifting audience tastes and partially due to Eisner's lessened direct involvement with the strip; Jules Feiffer was writing it by this point), it was decided that something drastic had to be done to grab readers' attention. And what could be more drastic than pulling the character out of his Central City crime story rut and putting him in charge of a government mission to space with a crew of criminals? 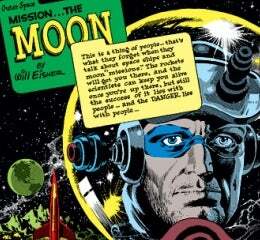 The "Outer Space" sequence of stories were written, for the most part, by Feiffer and illustrated by EC Comics' great Wally Wood - Despite the SF setting, they resisted the overly fantastic and continued to offer one-off stories focusing on character (Yes, even that story about the Hitler-alike being the first man on the moon), touching on topics like the effects of space travel on the mind with surprising subtlety and sobriety. They are wonderful comics; beautifully illustrated and a quiet version of SF comics that you just don't really see anymore (with the exception of something like Planetes). What they weren't was enough to save the series - After returning to Earth, the strip lasted one more week (that saw the Spirit recast as a "UFO Investigator") before being cancelled. After years of being out of print, the Outer Space sequence of stories will be available for readers in the May 7th-shipping The Spirit Archives Volume 24. And that's worth whatever champagne toasts you're willing to offer.